Raymond Ford has been a full time Director of Coaching for the last six years across America. Before that, he was a Physical Education specialist and Director of Athletic Departments in UK High Schools for over 10 years. From a young age, Raymond was ‘football mad’, soccer crazy, and played everyday he could. He even had the pleasure of meeting Bobby Charlton several times at his Summer Soccer School (camp). Ray combined his High School studies with opportunities to play for Stoke City, Stockport County, Leicester City, and Scarborough. He was voted "Sports Personality" at graduation from High school. During his time at Glasgow University, he combined playing 1st team soccer with coaching for Glasgow City and the Scottish Football Association. Ray played for Stenhousemuir & East Fife in the reserve league of Scotland and the 1st round of the Scottish Cup. "I was lucky enough to win a college tournament in Mons Belgium and an undefeated tour of the far east; Beating professional teams and colleges in Singapore, Malaysia, and Indonesia." Once Ray became a PE teacher in the UK, he gained his UEFA B License with the SFA. He regularly visited various parts of America to coach summer camps and loved the fun on camps with players of all abilities. During one such visit, he gained his NSCAA National Diploma. Ray also worked for Leicester City as a scout and Academy coach where some boys went on to play at the professional level. "I have taken school trips skiing in Europe and America, outdoor pursuiting in Snowdonia (Wales) and the Scottish Highlands, soccer tours to Malta, water sports activities in France during World Cup 1998. Best of all these, I organized a school soccer trip for 64 pupils and 8 staff to Barcalona FC, Spain. The boys and girl’s soccer teams had an excellent educational and cultural experience." Cory Weaver joined the Central Virginia United Technical Staff as the Assistant Director of Coaching in March 2016. Originially from Philadelphia, Pennsylvania, Weaver was an a Assistant Coach for the Men's Program at Taylor University (Indiana) from 2014-2016. 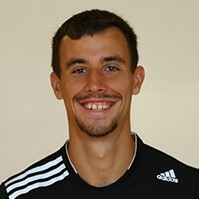 During his two years at Taylor he primarily worked with the defensive units, and he helped the Trojans to a 17-17-2 record with a second place finish in the Crossroads League Conference in 2014. Additionally, Weaver coached the Crossroads League Defensive Player of the Year in 2014 as well as helped the Trojans Receive Votes in the National poll 4 times during his time at the University. As a player, Weaver attended Wheaton College (IL) from 2008-2011. He was a two-time All Conference pick as both a defender and a midfielder and started 72 of 72 games he was available. Wheaton took two trips to the NCAA Tournament during his time and was ranked as high as #4 in the nation throughout his career. During his time in college Weaver participated in Bridges To The Pros European Tours out of Chicago, IL, which was lead by former USWNT Assistant Coach Bret Hall. He played Europa League 1st teams such as FC Groningen, SC Heerenveen, and Vitesse Arnheim (NED) as well as other first division sides from Sweden, Denmark, and Germany. Weaver then went on to play professionally in Australia with Brisbane Wolves/Bayside United out of Queensland Australia in the 2nd Division. Weaver's role within the club will be overseeing our Academy and Futures Program, which are the transition to Travel Programs at CVU. He will also be coaching Travel Teams as well as running camps, winter training, individual training sessions and scheduling for our Premier Block Teams.